Director: Ken Perlman has served as music director or co-director for several music-teaching festivals, including the American Banjo Camp, Banjo Camp North, Bath Banjo Festival, Maryland Banjo Academy, Midwest Banjo Camp, Northeast Heritage Music Camp and Suwannee Banjo Camp. He is also on the teaching staff for SBC. You can find a more detailed biography for him among the instructor and accompanist bios. 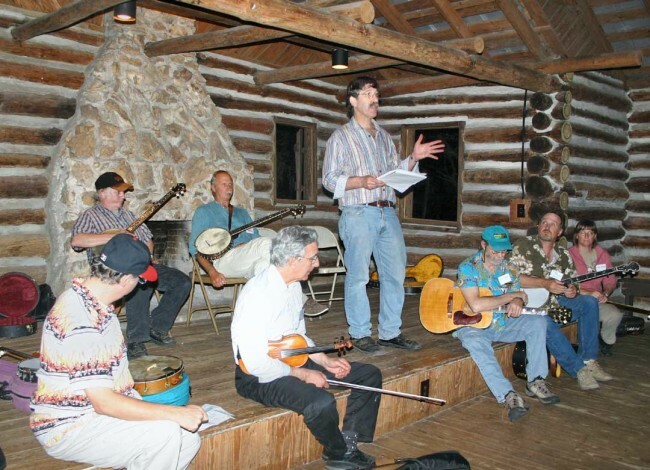 In 2002, Folklorist Jon Kay came up with the idea of starting up an old-time banjo camp at Stephen Foster State Park in White Springs, Florida and brought in Mark Johnson to help; Mark then suggested bringing in Ken Perlman to design the event. The inaugural run of SBC was held in the Fall of 2003, with about 40 students attending and a staff of about 6. Jon moved to Indiana after the first camp and the new admin at Foster soon lost interest in the event. In 2006, SBC moved to O’Leno State Park in High Springs, FL with Ken as its lone director. Chuck Levy joined Ken as Co-Director after the 2006 Camp and remained in that role through the 2015 Camp; Ken has served as sole director since then. SBC began adding bluegrass banjo to the program in 2007 (Bill Keith was our lone 3-finger instructor that year) and gradually expanded the bluegrass banjo program to where it was equal in size to our old-time banjo program; we then added a full-time fiddle track in 2011 and a full-time guitar track in 2014. SBC moved from O’Leno to its current location at the Cerveny Conference Center in Live Oak, Florida in 2014. Many thanks to all the founders and former directors of SBC!! !